Last Friday morning, when I was T minus 2 hours away from departing on a weekend-long wedding road trip, I discovered half a pint of raspberries sitting alone in my fridge. Rather than eat them by themselves, which would have been perfectly fine, I decided to bake something to take along on the trip. And what better than raspberries and chocolate? These muffins are really good — super moist and chocolately. And the best part about them is that they’re made from ingredients that are almost always found in the standard pantry. No room-temperature butter. No buttermilk. Just the baking staples. And in 20 minutes, you have some awesome muffins. What could be better? In a large mixing bowl, sift together the dry ingredients. Set aside. In a medium bowl, whisk together the wet ingredients. Add wet ingredients to dry, and fold together with a spatula until well mixed (it’s okay if the batter is lumpy). Add the chocolate chips and raspberries and very gently fold them into the batter. Distribute the batter evenly between 12 muffin cups. Bake for approximately 20 minutes or until a toothpick inserted in the middle comes out clean. These look fabulous! 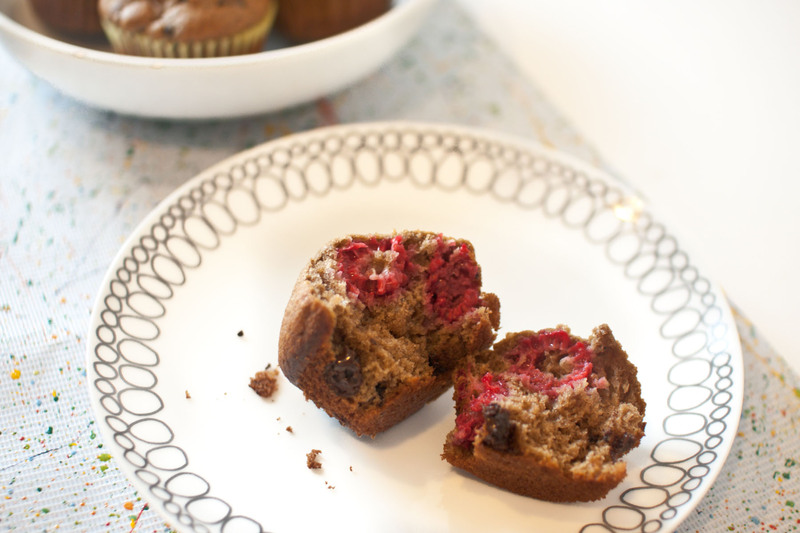 I was actually just looking for muffin recipes and I never thought to do raspberry! 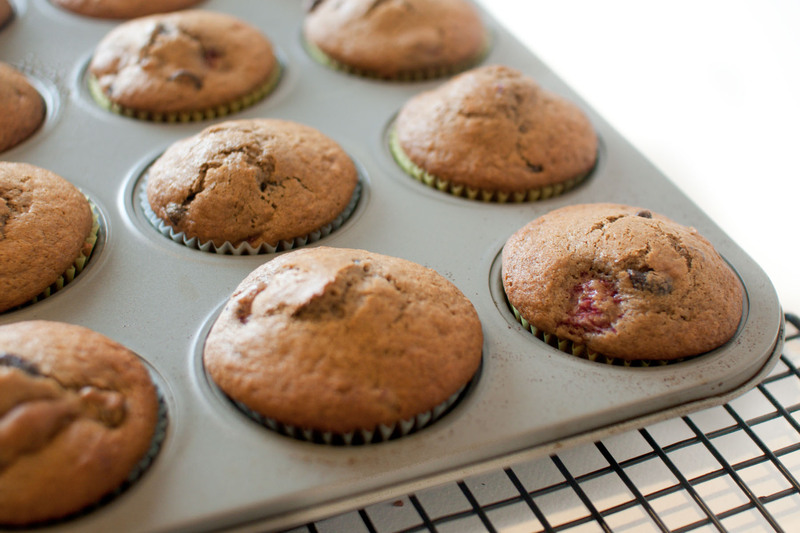 Those muffins are perfect for road trips, no mess and keep you full! You did fantastic job! I love combination of raspberries and chocolate..so yummy! The raspberries must have been these yummy muffins lovely and moist. I would take muffins on every road trip given half the chance. so gorgeous! i love the raspberry + chocolate combo! Am totally digging the color of this muffin. Love the “stormy” look to it with the swirls of pinky raspberry. :-p Sorry, am in a weird mood this morning. LOL — overdose on caffeine me thinks. And plus, I’m partial to Nigella. She’s one of my favorites! Chocolate and raspberries were MADE for each other! Yum!